A 2015 law highway law expires in fall 2020, and state DOTs would want to see an avoidance of funding disruptions for construction and maintenance projects, said Carlos Braceras, Utah Department of Transportation’s executive director and president of the American Association of State Highway and Transportation Officials. Federal policymakers, Braceras added, should focus on ensuring the timely reauthorization of such a long-term federal surface transportation bill with increased funding for state projects, as well as investing in multimodal systems along freight and passenger corridors, and ensuring states’ ability to safely deploy connected and autonomous vehicles. Such infrastructure investments would be realized through the enactment of a sustainable revenue solution for the dwindling Highway Trust Fund, which is projected to be unable to meet its obligations in the coming years. U.S. DOT relies on the fund to assist states. After President Donald Trump’s election, state officials touted the new chief executive’s calls for rebuilding aging infrastructure around the country. Trump indicated he was capable of modernizing the country’s transportation network. The officials’ enthusiasm, however, waned after a lack of progress from the White House and Congress on an infrastructure agenda. 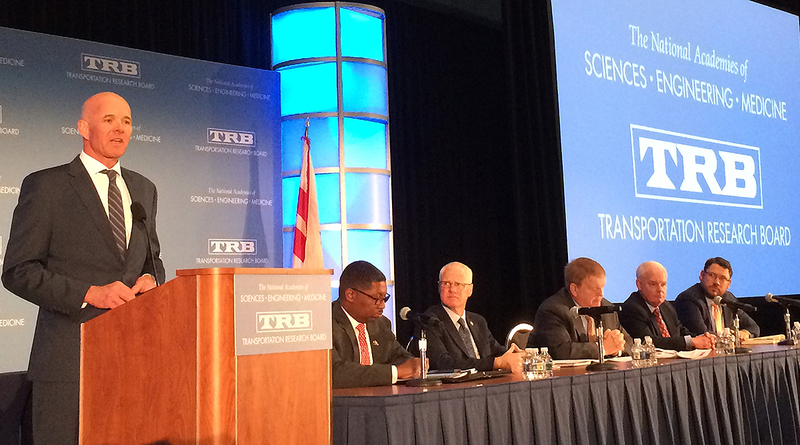 “We’ve had the attention by this administration and Congress on infrastructure, but action has yet to be taken,” said Braceras while moderating a panel with fellow state DOT executives during the annual meeting of the Transportation Research Board. Last year, Congress did not take up Trump’s 10-year, $1.5 trillion infrastructure proposal, nor a draft plan from former top transportation authorizer, retired Rep. Bill Shuster (R-Pa.) that proposed a fuel tax increase. The new House transportation leader, Rep. Peter DeFazio (D-Ore.), said he plans to unveil an infrastructure plan this summer. Senate Republican leaders have not indicated when they intend to unveil their plan. Trump noted infrastructure would be a priority for his administration in 2019. Border security and government funding have dominated the president’s agenda since the start of the year. Russell McMurry, commissioner of Georgia’s DOT, echoed Braceras’ sentiment, noting state agencies would find themselves on a funding cliff absent long-term federal support. Maryland’s top transportation officer, Pete Rahn, suggested considering a less politically controversial approach than a fuel tax increase when communicating with federal lawmakers. “I believe we’re at a point where I think we need to recognize the fuel tax has become so toxic that it is not the way that we should be funding transportation in this country,” Rahn said. More than half of the states have recently raised fuel taxes to boost their transportation accounts. Despite calling on their federal counterparts to do likewise, Congress and the president have shunned the approach. DeFazio has expressed support for an increase, yet many Democrats and most Republicans are either silent about it or reject the approach. Transportation stakeholders, such as the American Society of Civil Engineers and the U.S. Chamber of Commerce, point to a fuel tax increase as an ideal way to fund a long-term infrastructure plan. “We can do roads, bridges and transit with an increase in the gas tax and then that would continue, and we probably adjust it for inflation,” said Thomas Donohue, the Chamber’s CEO, on Jan. 10. Revenue from the federal 24.4-cents-per-gallon diesel tax and 18.4-cents-per-gallon gas tax is no longer adequate for the Highway Trust Fund in the long term. The tax rate was last increased in 1993.